CavityFree SF is committed to eradicating health disparities in childhood oral health and making San Francisco cavity-free. In 2013, a diverse group of stakeholders, after dedicating years separately tending to the consequences of this unaddressed health problem, came together to collaborate on a coordinated and concerted effort to defeat this preventable disease. Over the course of a year, this group engaged over 50 community-wide stakeholders to develop San Francisco's first citywide strategic plan to systematically improve children's oral health in San Francisco. Concrete plans for increasing access to oral health care among underserved San Francisco communities. 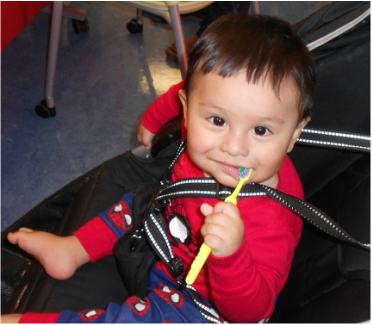 Ensuring oral health is integrated into San Francisco’s robust medical care systems. Promoting the importance of children’s oral health to decision-makers, parents, teachers, medical professionals and other caregivers. Creating citywide evaluation and reporting systems so that progress and challenges are visible to all stakeholders. One exciting strategy is to provide basic dental services outside of dental offices, in settings such as schools, neighborhood clinics, and childcare centers. This approach would ensure easy access to dental care for those children who currently do not receive traditional dental services. In order for this innovation to be sustainable, the plan includes efforts to capture Medi-Cal reimbursement available for these services, but currently not being used. In this way, more San Francisco children can ultimately be served. Showing their deep commitment to collaboration, the CavityFree SF collaborative is co-led by Lisa Chung and Margaret Fisher. Lisa is a public health dentist, Associate Clinical Professor at the University of California San Francisco’s School of Dentistry, and researcher at UCSF’s Center to Address Disparities in Children’s Oral Health. Lisa is deeply committed to population-based oral health promotion and building community collaborations. Margaret Fisher, RDHAP, is the Oral Health Consultant for the Children's Health & Disability Prevention (CHDP) Program at the San Francisco Department of Public Health. Margaret has worked for years to increase access to dental services for the most vulnerable and underserved children and brings a passion to make policy changes to address inequities in children's oral health. Tooth decay is the most common chronic childhood disease, but is a largely unrecognized public health crisis. If left untreated, tooth decay leads to pain and infection resulting in difficulty sleeping, eating, and attending school. In San Francisco, emergency department visits for preventable dental problems are higher than that for asthma and diabetes combined. Untreated tooth decay is 2-3 times more common for children of color, and this disparity has worsened since 2000 in the City. Despite being virtually 100% preventable, over 40% of San Francisco children have experienced this chronic problem by the time they reach Kindergarten.